In the Union of Socialist Soviet Republics at the present time the anarchists no longer enjoy any influence over the masses. They are met with only as isolated individualists. The reason for this is the victory of socialism in the U.S.S.R. The old Russia, landlord and petty-bourgeois peasant Russia, which fostered anarchism and gave birth to the founders of anarchism, those repentant aristocrats--Mikhail Bakunin, Peter Kropotkin and Leo Tolstoy--has passed away. In place of this old tsarist Russia, a new state, a Soviet socialist state has been built during the last 20 years, the like of which history has never known. This state arose in the flames of civil war, as a result of the victorious socialist, proletarian revolution. This revolution opened a new page in world history. In October, 1917, a big breach was made in the system of imperialist states. The young Soviet government of workers and peasants, guided by the Bolshevik Party, the Party of Lenin and Stalin, succeeded in vanquishing the forces of all the enemies who rose against it. It abolished the capitalist and landlord classes. In the U.S.S.R. there is not a single capitalist or landlord. The Soviet state routed the armies of the whiteguards, the armies of the bourgeoisie, although they were commanded by the old tried tsarist generals and included nearly all the old officers. The Soviet state defeated the armed intervention and the economic blockade of the 14 capitalist states which joined in the struggle against it. The Soviet state vanquished economic chaos and built up a splendid industry and agriculture equipped with the most up-to-date machinery. In place of the old, dilapidated, capitalist, landlord and small-proprietor system of economy, the Soviet state, in accordance with the plan drawn up by the Communist Party, has built up a new, powerful socialist system of economy, with a more developed technique and higher productivity of labor. It has raised the economic, political and cultural standard of life of the entire population. It has created a splendid Red Army, the only one of its kind, which stands guard over the banner of communism, over the life, labor and property of vast masses of the people on one-sixth of the globe. The Soviet state has secured the great amity of nations in the U.S.S.R., thanks to the correct national policy of the Communist Party of the Soviet Union, the vanguard of the Communist International. This Party arose 40 years ago in the form of small secret workers' circles which were persecuted by the tsarist government. Its chief organizers were Lenin and Stalin, those brilliant theoreticians, strategists and leaders of the revolution. The workers and peasants of Russia achieved their splendid results primarily because from its very inception the mass revolutionary working class movement in Russia was headed by the Bolshevik Party. This Party organized the advanced workers, it organized the armed insurrection, it organized resistance to the whiteguards and foreign intervention, and it organized their defeat. The Bolshevik Party organized the new, Soviet, proletarian state; it organized the new system of economy. It ensured the great victories achieved by the working people. But it succeeded in doing all this because it fought against all forms of opportunism in the working class movement, including anarchism. The anarchism of Bakunin and Peter Kropotkin was the theory of the Narodniks of the Land and Freedom society, who wanted to secure "land and freedom" under tsarism. During the 1905 Revolution anarchism in Russia took the form of terrorist groups which organized plots against the lives of tsarist officials and raids on banks and government institutions. During this period some of its adherents began to go over to the anarchosyndicalists. In their propaganda the Russian anarchists tried to create enmity between the revolutionary Socialist intellectuals and the working class. 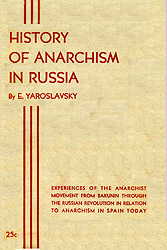 After the Revolution of 1917 had triumphed, the anarchists in certain localities of Russia attempted to put their doctrine into practice, and thus came into sharp conflict with the whole course of the revolution. In the form of the so-called Workers' Opposition, anarcho-syndicalism attempted to establish itself in the working class movement, in the Communist Party, under the proletarian dictatorship. At the most critical moment in the struggle of the proletariat against the united forces of the Russian and the international bourgeoisie, the anarchists engaged in dividing up the residences and property they had plundered from the rich, never realizing that in place of the old demolished system the proletariat must build its socialist system of economy. In the south of the Ukraine, the anarchists-Makhno and his supporters-attempted to put into practice the ideal of anarchism. For the working people of the Ukraine and the whole of the Soviet Union the name of Makhno and his hordes is synonymous with the blackest crimes against the revolution, against the cause of the working class. Thus the first proletarian revolution in the world tested not only the doctrine, program, strategy and tactics of the Communists, but also the doctrine, program, strategy and tactics of the anarchists. In their struggles the vast masses of the people throughout the world can benefit by the experience of the October Revolution. Of course, they must take into account the specific features of the struggle for emancipation in their own countries, but they would be making a great and irretrievable mistake if they simply disregarded this experience and failed to apply it. What could one say about people who obstinately refused to take a known and tried road leading to the goal but must at all costs take a different road, which leads them to defeat? The workers in those countries where they now have to choose between the doctrine of the anarchists and that of the Communists should know both these roads. In 1884 the first Russian Marxist group, known as the Emancipation of Labor, was founded in Switzerland by Plekhanov, Axelrod, Deutsch and Zasulich. It should be noted that all the organizers of this group had for several years been prominent in the Narodnik movement, and had belonged to the Bakuninist rebel wing. The formation of this group was preceded by a split in the Land and Freedom organization, which broke up into the People's Will and the Black Redistribution (Cherny Peredel) groups in 1879. The founders of the latter group afterwards formed the Emancipation of Labor, carrying with them their old anarchist views on the revolution and the state. The Black Redistribution group did not have much influence on the revolutionary movement in Russia. In a letter to Sorge, written on November 5, 1886, Marx ridiculed the Black Redistribution as a Bakuninist semianarchist group. This page has been accessed times since November 20, 2001.